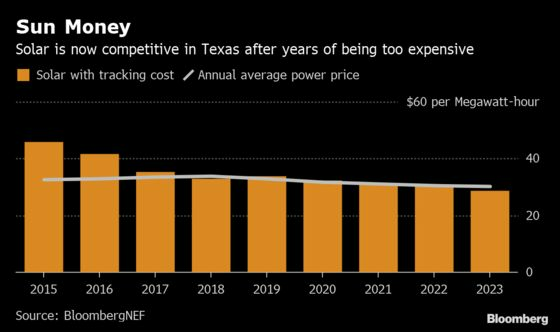 (Bloomberg) -- Texas, home to the world’s largest oil reserve and America’s biggest source of coal-fired power, is on the verge of a clean-energy boom. Unlike in California and other leading solar states, development in Texas isn’t being spurred by renewable-energy mandates. (Texas satisfied its clean-energy quota years ago with wind power.) But at the moment, the price is right for solar. Solar’s other key edge in Texas: it complements the state’s sprawling wind farms. Turbines there generate most of their power at night. Solar, meanwhile, peaks with the sun, providing electricity when air conditioners are cranking and oil fields are bustling. Plus, Texas has the advantage of being an easy state to build in compared to, say, California, said Tom Buttgenbach, CEO of solar developer 8minutenergy Renewables LLC. All those dynamics -- combined with a growing pool of investors offering a variety of financing options -- have developers rushing into the state. “There’s tremendous incentive for solar to be built,” Colin Smith, an analyst at Wood Mackenzie Power & Renewables, said in an interview. Solar owes much of the opportunity to the oil and gas industry. Output in the Permian Basin of West Texas, which produces more than 4 million barrels of oil a day, has doubled in three years. Gas has become so plentiful that prices have turned negative as explorers pump more fuel than pipelines can handle. Forecasters say there’s even more growth to come. Those drilling operations, along with the economic growth they’ve sparked, are pushing up demand for electricity. Existing power plants are struggling to keep up. Electrical demand in Texas is forecast to reach a record 74.9 gigawatts this summer, topping the previous high set last July. The grid operator, the Electric Reliability Council of Texas Inc. or Ercot, has warned of shortfalls. Prices, which during the day average about $32 per megawatt-hour, are apt to spike. They may even hit an unprecedented $9,000, Ercot said. “We’re expecting a super-charged market this summer with volatile pricing,” said Jeff Thibodeau, an analyst at Genscape Inc. The Texas solar rush is essentially a big bet on those price jumps, said Jigar Shah, co-founder of clean-energy financier Generate Capital Inc. Traditional long-term contracts to sell power are rare in Texas. So most solar developers will sell power directly into the wholesale market. “Solar companies think they can get paid enough on the spikes,” Shah said in an interview. One hurdle solar may face is a property-tax abatement popular with developers that’s scheduled to end this year. Katherine Gensler, vice president of regulatory affairs at the Solar Energy Industries Association, said that would have a “material effect” on solar. Buttgenbach of 8minutenergy said many deals “may not pencil” without tax abatements. 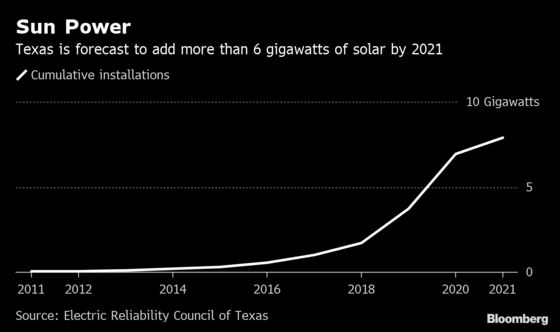 Nonetheless, Ercot forecasts Texas’s solar capacity will quadruple over the next three years, with 2 gigawatts added this year, 3.2 in 2020 and 1 in 2021. The boom comes more than a decade after high power prices and strong breezes on the Texas Panhandle triggered a flood of wind-farm development. So many turbines were installed that by 2005 they were producing more power than the local grid could handle. Texas spent about $6.9 billion on new transmission lines to deliver 18.5 gigawatts of renewable energy to Dallas, San Antonio and other big cities. Texas’s solar boom may be fleeting, too. As more power plants come online, the price spikes that are making the market so enticing for developers will ease, bringing down overall prices, BNEF analyst Joshua Danial said. He estimates adding 5 gigawatts of solar would reduce Texas power plant revenue by 11 percent, or $1.43 billion a year. In the meantime, solar is finally having its moment in Texas. “There’s a lot of room for solar to grow,” said Smith, of Wood Mackenzie Power & Renewables.